The fifth survival system on the Mountaineers Ten Essentials list is First Aid Supplies. Here's why it's essential to have one and the items that should be in it. If you’re out climbing on the cliffs or in the mountains, there is always the possibility for injury to either yourself or your climbing partners. If you carry a basic first aid kit and know how to assess injuries and to use your first aid supplies, it can make a big difference in the outcome. Remember that using your head, knowing what to do in a medical emergency situation, is the most important part of your first aid kit. Buy Backcountry First Aid and Extended Care by Buck Tilton, FalconGuides. Accidents happen in the great outdoors when you’re out climbing. You trip and sprain an ankle. You fall and break a leg or arm. You get hit with loose rock and suffer a head injury. If you’re carrying a basic first aid kit in your climbing pack, then you can mitigate some of the damage from these injuries. You’ll be able to patch yourself or your buddy up enough so that everything isn’t as bad as it could be. You’ll be able to survive until you get to a hospital. Knowing how to use your first aid supplies is imperative. You can carry the biggest first aid kit you can buy but if you don’t know first aid then it’s under-utilized. If you’re a going to be a serious and competent climber, alpinist, and outdoorsman, then you need to have more than a passing knowledge of first aid. The best and easiest way to learn first aid is to take an American Red Cross class in CPR and first aid which prepares you to deal with life-threatening emergencies. If you don’t have time for a class or there are none nearby, then take Red Cross on-line training and work at your own pace. If you took a class in the past, your knowledge has probably slipped. It’s good to do a refresher course every year to keep your first aid skills up to date. Climbing accidents usually fall into two categories—minor injuries and catastrophic emergencies. The essential first aid supplies you carry should cover the in-between injuries. Before you put together or buy your first aid kit, it’s a good idea to think about common climbing injuries and then fill your kit with supplies to treat those ailments. Basically, you should be able to treat wounds, bleeding, blisters, headache, pain, and broken bones. 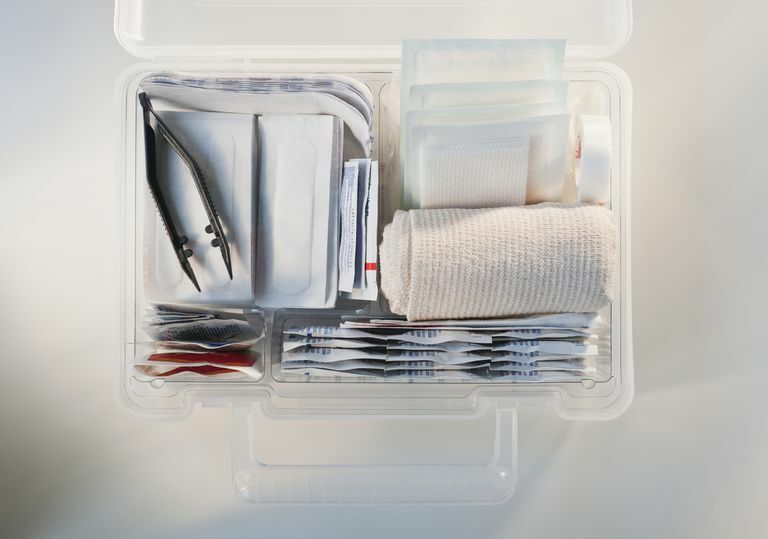 It’s difficult to treat traumatic injuries with the basic supplies you’ll carry. It’s best in those situations to get help and helicopter immediately and get the patient to a trauma center. What should you carry in your basic climbing first aid kit? It’s difficult to decide because you want to keep the kit small and lightweight, but you also want to have enough to treat severe injuries. It’s up to you to find that balance. You can buy prepackaged first aid kits and they’re pretty good but you also should consider personalizing the kit by adding items you might need. For day-long climbing trips, keep your kit small, weighing about six ounces. For longer multi-day trips that include backcountry hiking, it’s worthwhile to carry a bigger kit, especially since you’ll be farther from help. Just keep it simple and know how to use it.